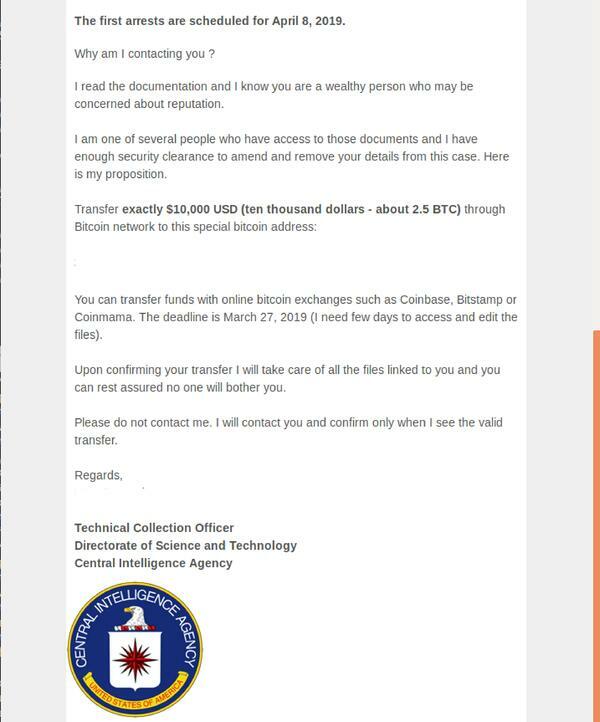 Purporting to be from a ‘technical officer’ working in the Central Intelligence Agency (CIA), the email actually comes from one of a large number of new domains set up for the purpose of running the scam. The body of the email contains a long message advising the recipient that their personal details (including their home and work address) are currently on file under a case regarding the "Distribution and storage of pornographic electronic materials involving underage children." The email advises the recipient that the case is part of a large international operation to arrest individuals suspected of paedophilia. It claims that the data used to acquire their personal information for the case includes recipients’ web browsing history, chat-room logs and social media activity logs, among others. It adds the first arrests regarding the case are scheduled for April 8, 2019. The message then details why the particular recipient is being contacted and also provides a way to avoid any prosecution. For a payment of $10,000 USD made via Bitcoin, the sender promises to remove the recipient’s details from the case. Cybercriminals behind this attack have used several techniques to boost the legitimacy of the email scam. Not only have they included CIA’s logo in the email signature but have also taken care to craft a grammatically sound and well-formatted email. Scammers are attempting to blackmail me! Now what? It is key to remember that these scams are all fake, and cybercriminals are likely to be supplying you with false information and/or threats. By tapping into your fears and paranoia, they are tricking you into supplying them with Bitcoin currency. MailGuard urges the public to not panic and refrain from making any payments. Recipients should report suspicious activities that could threaten public safety.